Only going to one mining investment show? Make it this one. PDAC International Convention, Trade Show & Investors Exchange is the world’s leading Convention for people, companies and organizations in, or connected with, mineral exploration. The four-day annual Convention held in Toronto, Canada, has grown in size, stature and influence since it began in 1932 and today is the event of choice for the world’s mineral industry. In addition to meeting over 1,000 exhibitors, 25,122 attendees from over 100 countries, it allows you the opportunity to attend technical sessions, short courses as well as social and networking events. For more information on PDAC, or to register, please visit the PDAC website. 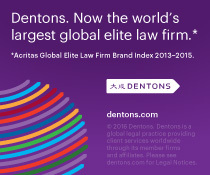 Join Dentons for our annual cocktail reception during PDAC. Come catch up with fellow stakeholders in the mining industry over an enjoyable evening of Hors d’oeuvre, drinks and networking. Take advantage of a global networking opportunity at the 8th annual Women in Mining International Reception hosted by Women in Mining Canada, designed to bring together industry leaders, academia, employers, students and job seekers from around the world. Here, you can connect with the people and personalities who comprise this dynamic industry and celebrate the global contributions that women have made to this vibrant industry – this reception is full of the energy that will fuel your PDAC experience. Afternoon appetizers and refreshments will be served. Visit Women in Mining (WIM) Canada on the Trade Show floor at Booth 913, pre-and post-reception. Become a member, learn how to become involved through volunteering or participating on committees, catch up with old friends and grow your network. WIM Canada is a national not-for-profit organization formed in 2009 and focused on advancing the interests of women in the minerals exploration and mining sector. For more information on Dentons’ involvement at PDAC or to attend an event, please contact Kylie Panciuk.